An extraterrestrial three-pronged sonic organism has just landed in Canada, bringing new sounds of degradation and alienation to all admirers of the more technical and progressive versions of Thrash Metal. In the city of Brampton, located in the peripheral suburbs of Toronto, Ontario, resides a three-pronged sonic organism known as Droid. Though conceived in 2012, it has been the amalgamation of years of shows, rehearsing and writing that has led to the fully realized aural representation of their efforts in their 2017 debut album, titled Terrestrial Mutations. And this Canadian Sci-Fi Thrash Metal entity is more than ready to present to fans of renowned acts such as Voivod, Megadeth, Annihilator and Anthrax, among many other bands known for blending aggressiveness and dexterity in a compelling way, an amazing alternative in the world of underground thrash. 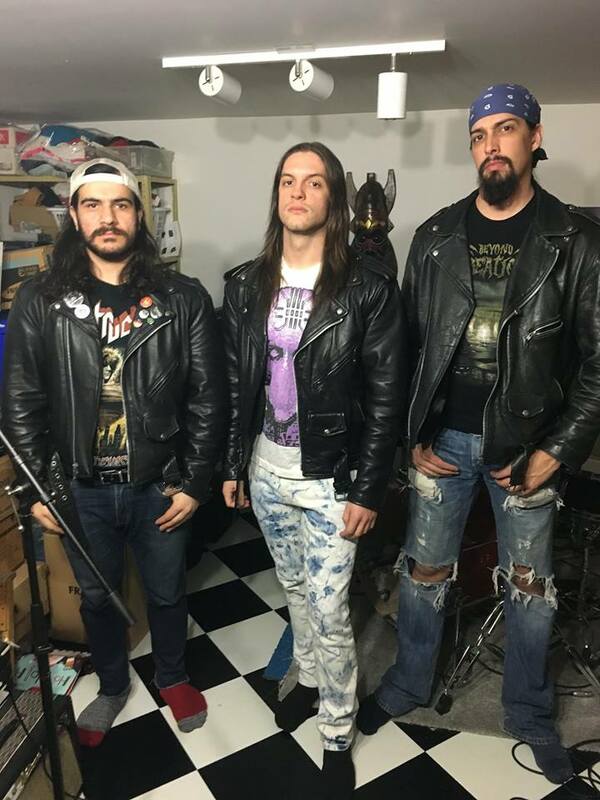 Since their inception, Droid already released the demo Malfunction, in 2013, and an untitled promo in 2014, followed by the six-track EP Disconnected, in 2015, but it’s with Terrestrial Mutations that the power trio comprised of Jacob Montgomery on vocals and guitar, Michael Gabor on bass and Sebastian Alcamo on drums reached a much higher level of speed and harmony, bringing new sounds of degradation and alienation to all admirers of the more technical and progressive versions of Thrash Metal. However, if you’re a fan of old school thrash, don’t think that they’ll sound too modern for your ears, as they always keep their sonority deeply inspired by the foundations of the genre. For instance, the piercing guitar sounds by Jacob welcome the listener to the Sci-Fi world of Droid in the opening track Amorphous Forms (Shapeless Shadows), where the band delivers old school Thrash Metal with Sebastian pounding his drums mercilessly throughout the entire song. In Suspended Animation, we face lots of groove flowing from the guitar by Jacob and the bass by Michael, bringing those “dancing and slamming” elements from the music by Suicidal Tendencies as well as lyrics that couldn’t sound more thrashier than this (“Cold saline injected / straight through the heart / drained of blood given / hours to restart”); whereas in Abandoned Celestial State we’re treated to a fast and groovy start with a Blues-ish vibe led by Sebastian with his beats, generating a fun and interesting ambience for Jacob to declaim the song’s lyrics in a rabid manner. In a nutshell, this excellent tune offers the listener a well-balanced mix of Thrash and Groove Metal, and just like a Sci-Fi movie it follows a “script”, ending in a dark and somewhat apocalyptic way. 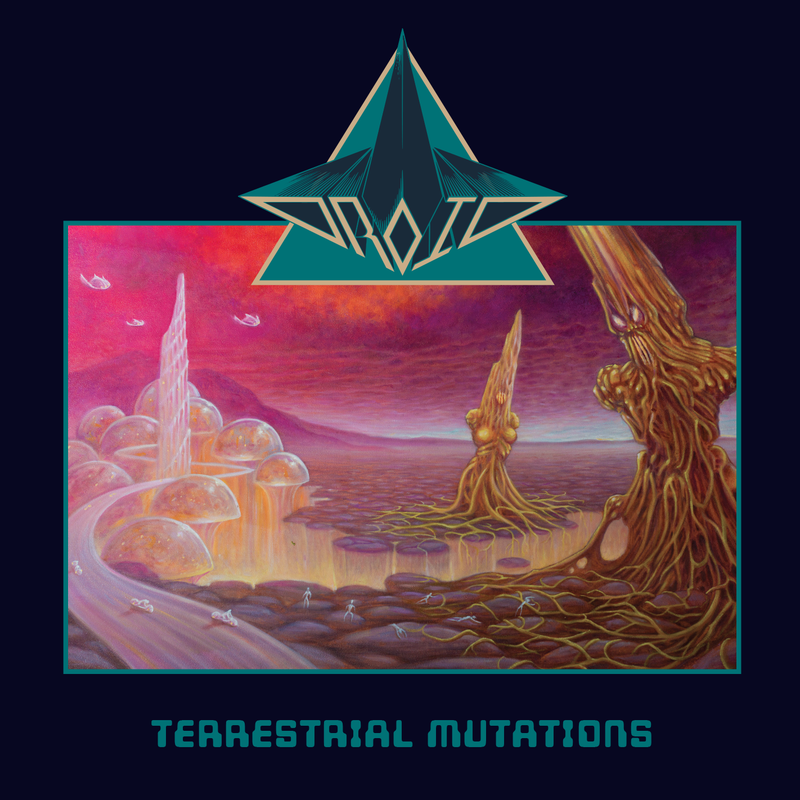 The title-track Terrestrial Mutation brings forward almost 10 minutes of 80’s-inspired Thrash Metal, starting with a somber, eerie intro before Jacob comes ripping with his riffs until the musicality reaches a very melodic shape. However, the song loses its grip mainly due to its length, but that doesn’t mean there isn’t a lot of good stuff to enjoy such as the low-tuned metallic bass lines by Michael and the song’s more progressive pieces. Fortunately, a piano intro presents to the listener another harmonious and visceral creation by Droid, titled Pain Of Reincarnation, where Jacob, Chirs and Sebastian put all the potency of their instruments together to generate a truly exciting sounding, feeling like Thrash Metal with Rock N’ Roll and Hard Rock elements, which turns it into one of the top moments of the album for sure. And in Temptations Of Terminal Progress the band fires an electrified feast of riffs, harsh and demented growls and pounding beats, also presenting interesting breaks and traditional thrashing lyrics (“The soothsayers learning / it’s best not to reveal what / he knew / the bones they are burning / for the means for the many / not the few”), morphing into a display of progressiveness mixed with elements from Blues and Jazz at times. The rumbling bass lines by Michael and the fierce beats by Sebastian dictate the rhythm in the high-octane and electrifying tune Cosmic Debt, an old school Thrash Metal chant that will certainly ignite some good circle pits with highlights to the deranged vocals by Jacob à la Paul Baloff; followed by Excommunicated, a lot slower than its predecessors but still heavy and groovy, with Jacob delivering some cutting guitar riffs while Sebastian keeps smashing his drums effectively. The song never really takes off though, falling flat after a while, but at least the closing song, Mission Drift, with its over 10 minutes of music, showcases all the band’s passion for progressive and heavy sounds, with the bass punches by Michael sounding truly awesome. This is the perfect depiction of Progressive Thrash Metal, bringing intricate guitars and drums, and obviously keeping the stamina and complexity at a very high level until it fades into a somber, wicked conclusion. The extraterrestrial thrashers from Droid can be better examined at their Facebook page, while Terrestrial Mutations can be purchased at their own BandCamp page, at the Nightbreaker Productions webshop, at the Hells Headbangers webshop, at the Temple of Mistery Records webshop, or at Discogs. As you can see, the music by Droid truly exists and is easy to find (as opposed to ETs), so if I were you I would support such promising power trio by buying their album, in order to ensure their future endeavors become a reality and keep their Sci-Fi soundings as thunderous as possible, piercing our metallic minds. Best moments of the album: Amorphous Forms (Shapeless Shadows), Abandoned Celestial State, Pain Of Reincarnation and Cosmic Debt. Worst moments of the album: Terrestrial Mutation and Excommunicated. This entry was posted in 2017 New Releases and tagged abandoned celestial state, amorphous forms (shapeless shadows), brampton, canada, cosmic debt, droid, groove metal, hard rock, jacob montgomery, michael gabor, mission drift, nightbreaker productions, ontario, pain of reincarnation, progressive thrash metal, rock n' roll, sci-fi thrash metal, sebastian alcamo, suspended animation, terrestrial mutations, thrash metal by Gustavo Scuderi. Bookmark the permalink. The bass on this album was recorded by myself, Michael Gabor. Check the CD booklet or check out metal archives. Please give credit where credit is due. Thanks. Hi Michael. I’ve just fixed the review replacing Chris Riley with you. Thanks for letting me know. The promo package I got had Chris as the bass player, but that’s OK, at least now the review is correct. Thanks again ,and stay metal!